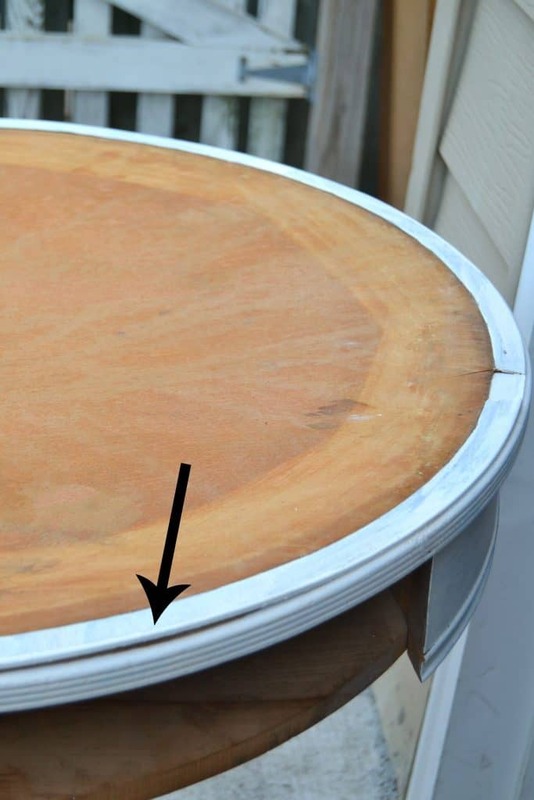 DIY Painted Round End Table For Any Space In Your Home. I do this painted round end table for a themed makeover with a group of bloggers. The theme this time around was neutral. What is the first thing that comes to your mind when you hear the word “neutral”? I think neutral is any color or style that works well with many other colors and styles. Does that even make sense? A neutral foundation lets everything else stand out and draw your attention in. With that being said, I think decorating in all neutrals can be stunning too. If you ever look at a room that has been done in all white, it is amazing how many different colors you will see. For this project, I stuck with white because that is what I envisioned for this table when I picked it up. 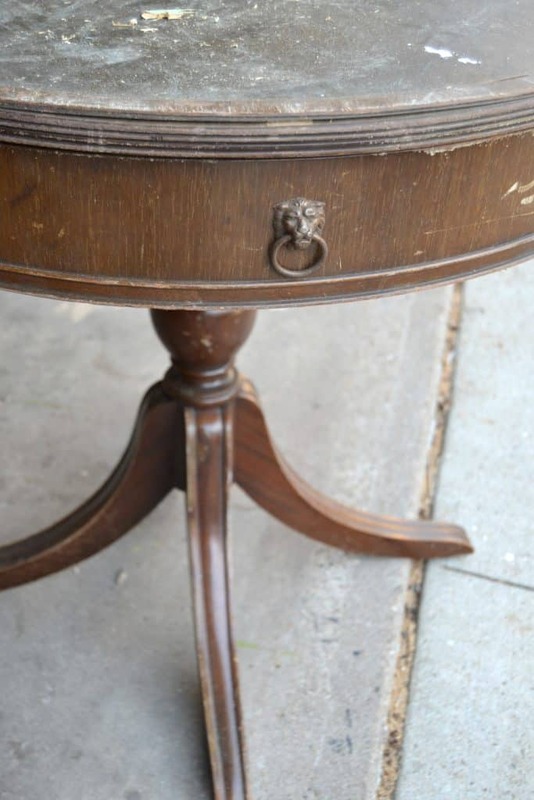 This round end table was not in the best condition, but it did have so much potential. The hardware is great and both drawers still had it! That’s always a bonus. 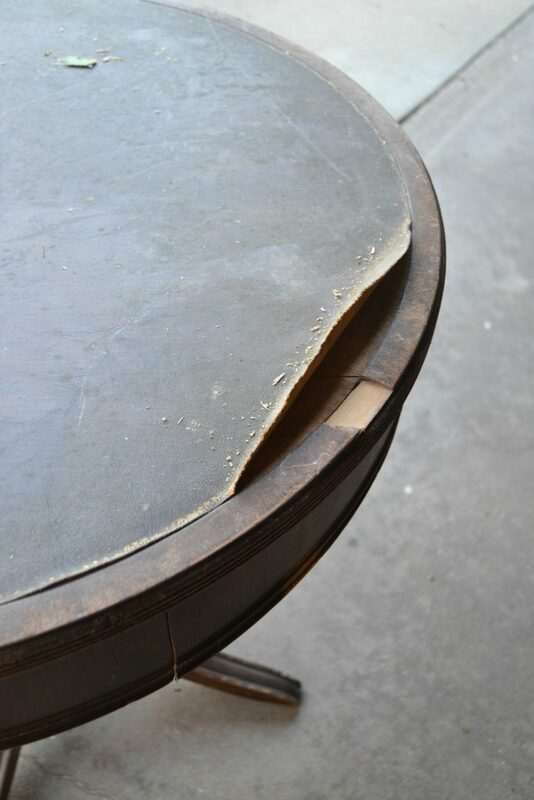 The round end table had a faux leather top that was coming off. There was also a piece missing from the rim around the table. I was able to pull the faux leather off easily. I was really excited because I thought that was going to be the end of the “fixing” part of this table. I was wrong. The entire top layer was coming off! I thought this was going to be a big problem and lead to a long list of issues. I was wrong again. 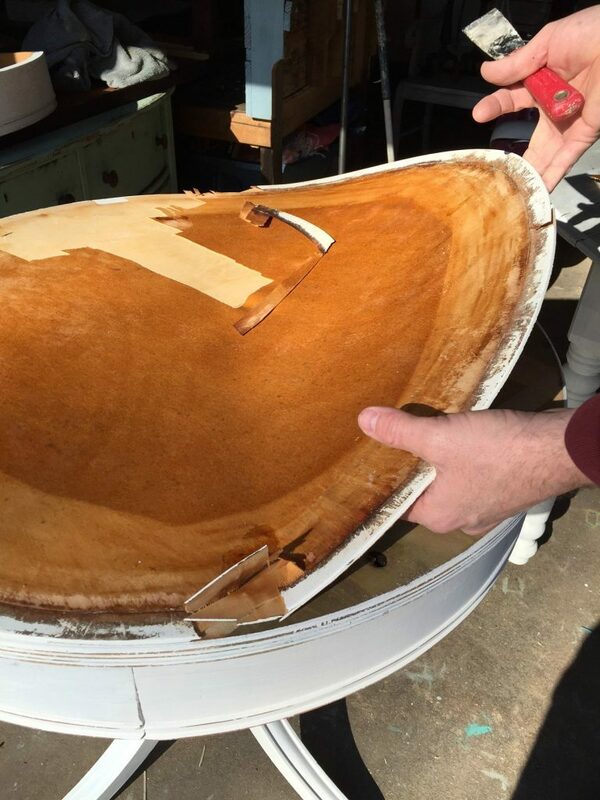 We were able to remove that entire layer off the table and that was the end of it. 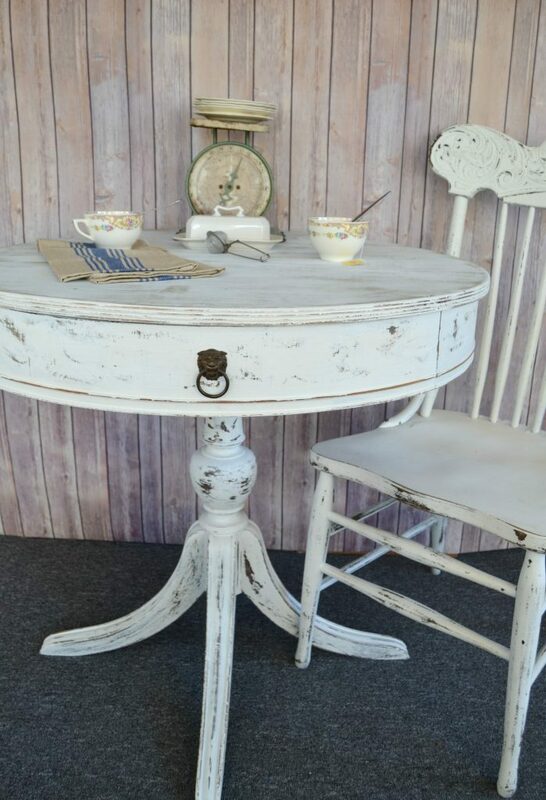 After we got the table “fixed”, I painted it in “Picket Fence” from Fusion Mineral Paint. Then, I used my favorite DIY tool to distress the table. Since we had to remove the top layer, we were left with raw wood. Not wood I could stain either. 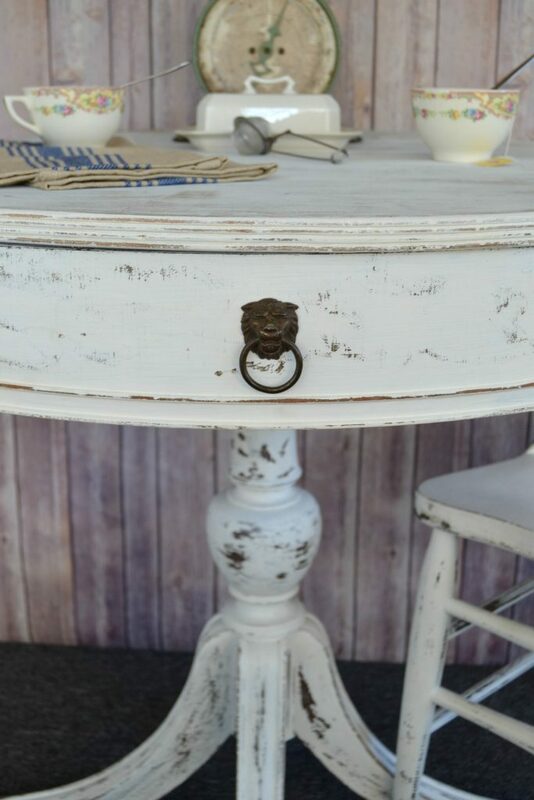 To make it fit the look of the rest of the table, I first painted it with “Linen” from Fusion Mineral Paint. Then, I dry brushed over the “Linen” with “Picket Fence”. This gave the top a little different “distressed” look that I really liked. Now, the hardware really stands out. This table is BIG. 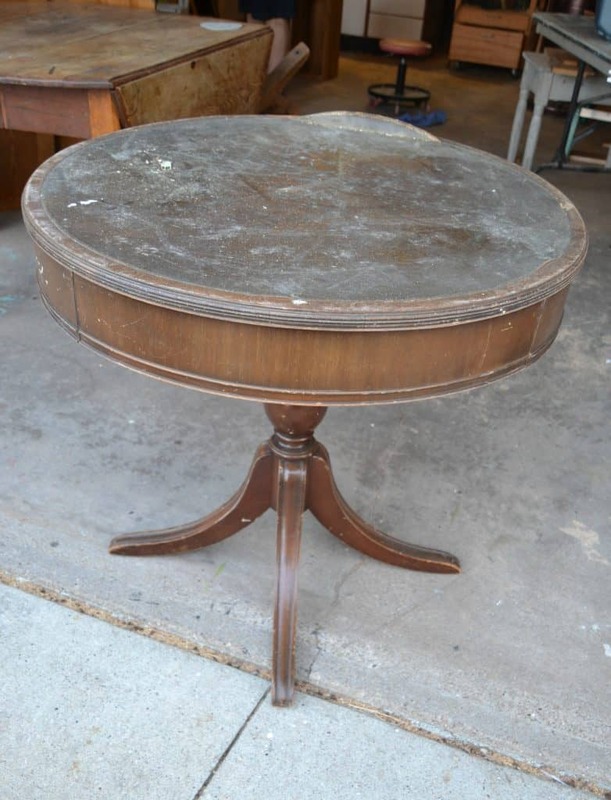 It is not your standard, round side table. It would work perfect for a small eat-in kitchen. I was surprised that our dining room chairs fit with it so well. When I was setting the table, it reminded me of the little table Matt and I had in our first apartment. It is the perfect size for two. Like I said earlier, neutral can mean different things. When I bought this table, I thought it would be stunning in white and when I saw this month’s theme for Furniture Makeover Day, this table fit the bill. What is your favorite neutral color? Do you like to decorate with neutral tones? What a score, Lindsay! That top would have had me holding my breath too. You rocked it! Oh I LOVE when these drum table get a makeover! They always seem to be the most deserving of one. I love how it turned out! Great job! Yes! I have a smaller one I will be sharing soon! Thanks Karin! This is such a pretty table! I really like the distressing and the dry brushing technique you used on the top. So glad the damaged pieces came off so easily too! Me too Amy! I was lucky! Lindsay, what a fabulous makeover! 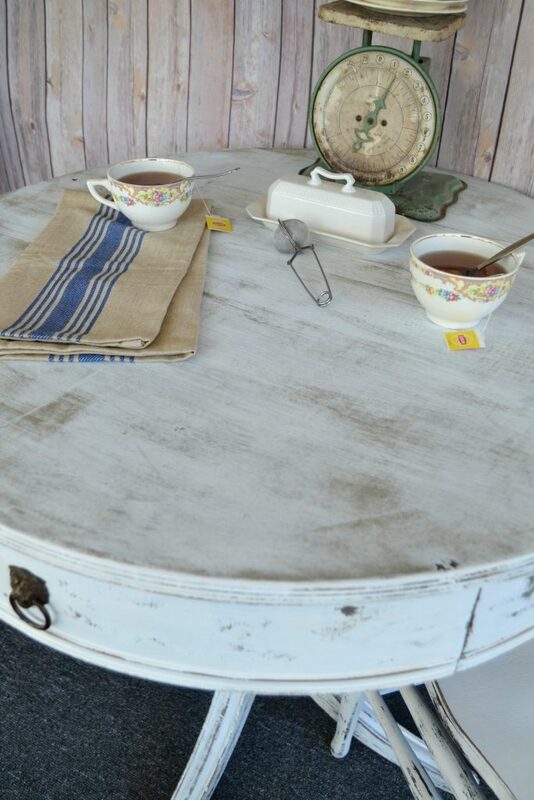 You gave this table loads of character and I love the chippy chair you paired with it. Very nice – pinning and sharing. Super color choice and so glad you got through the layers to give it a new life as a beauty in white. The end result of this makeover is so pretty! You got really lucky when the leather came off in a big piece. That could have been a big pain if you had to chip it off bit by bit. I was surprised to see how big this piece actually is. I was expecting it to be a side table, not big enough to use with chairs. I know! I thought the same thing. It is a big one! I will be sharing a small one soon. Lindsay, this is a lovely table and I think your neutral is a perfect fit! Good job in getting the top of this piece to where you could work with it!! Enjoy! Great makeover, Lindsay! 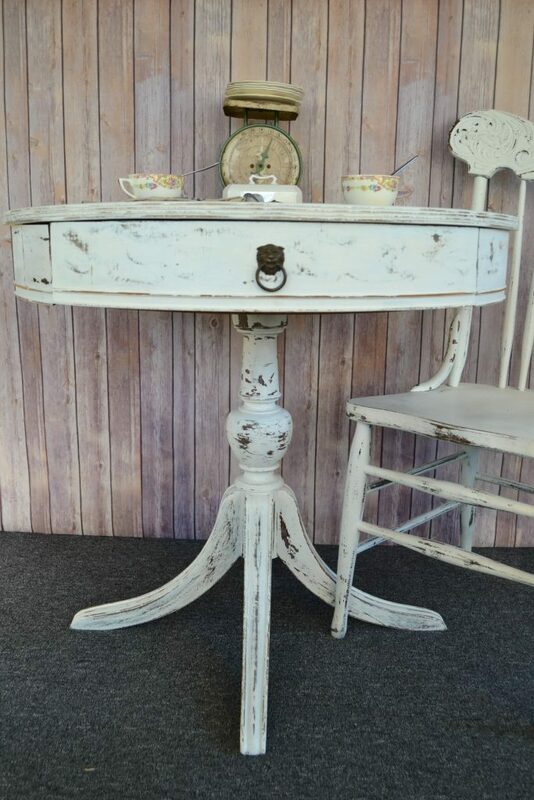 Love this little table! Your table looks great! We each have drum tables in our homes…maybe we need to pullout the paintbrushes LOL. Cheers to a great weekend! 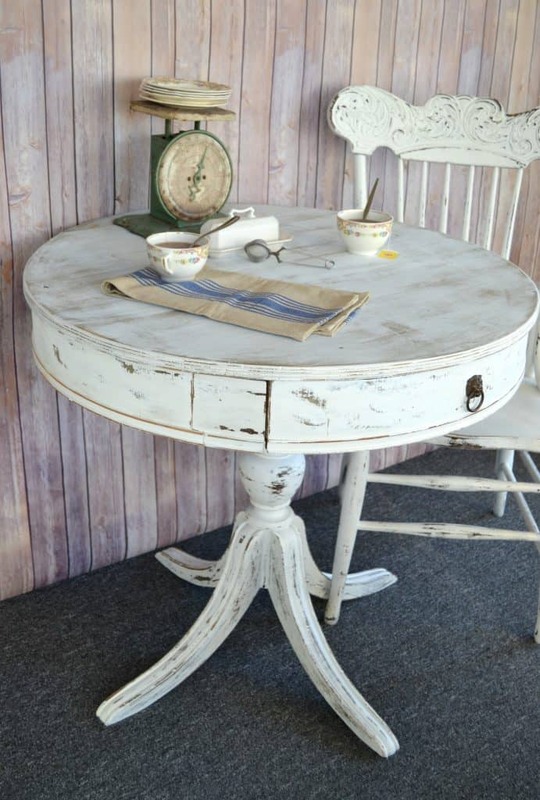 Lindsay, I love your trash to treasure table makeover – you did a fantastic job reviving it! Lots of work with a great result! Nice job! Adventures like not knowing what’s under that table top are part of what makes this so much fun. My neutral color choice tends to be beige. I find that accent colors and other features pop really well with beige. Great stuff, and I just liked your page on Facebook!